An audit from the European Union's (EU) Food and Veterinary Office (FVO) has resulted in a ban on the sale of horsemeat processed in Mexico. But one slaughter proponent doesn't believe the ban will stop the flow of horsemeat sold offshore or improve the welfare of American horses intended for processing. A fourth horse in Davie, Florida, has died after consuming an equine feed tainted with an antibiotic intended for use in cattle. In October three horses at Masterpiece Equestrian Center in Davie died after ingesting horse feed manufactured by Lakeland Animal Nutrition, Inc. (a subsidiary of Alltech). Further investigation revealed that the feed was contained monensin , an ionophore antibiotic used in ruminants, swine, and poultry that is toxic to horses. Lakeland voluntarily recalled three of its Signature Status Pellet products and its LAN 10 Pellet products manufactured between Sept. 8 and Oct. 8. Last month, the firm announced that it would cease manufacturing horse feed altogether. Subsequently, the owners of horses residing at Masterpiece Equestrian Center have retained attorney Andrew Yaffa to represent them in restitution talks with Lakeland. The Australian Veterinary Association (AVA) welcomes bills recently introduced into Parliament which are designed to strengthen disease control measures to better manage the risk of diseases entering and spreading in Australia. Julia Nicholls, BVSc, PhD, FACVSc, AVA president, said veterinarians are involved at all levels of Australia’s quarantine and biosecurity systems. “In large-scale outbreaks such as the 2007 equine influenza outbreak, an army of government and private veterinarians is called on to take part in the emergency response," she said. “Strong, effective protection against imported pests and diseases is critical to our agricultural industries, as well as to the wellbeing of Australia’s animals and people. The AVA submitted comments on the consultation draft of the new legislation to replace the century-old Quarantine Act 1908. “Our submission called for a more seamless biosecurity system which these bills will provide,” Nicholls said. For more information on the Biosecurity Bill 2014 and the supporting legislation, visit www.agriculture.gov.au/biosecuritylegislation. Full implementation of an enhanced zero-tolerance policy regarding anabolic steroids use in Great Britain's racehorses has been delayed until March 2015, the British Horseracing Authority (BHA) announced Dec. 19. A zero-tolerance post-sale blood test for anabolic steroids will be an option offered to buyers at the 2015 Magic Millions Gold Coast yearling sale, taking place in Queensland, Australia, in January. Back Country Horsemen of America preserves our right to ride horses on public lands, and seeks to inspire respect and appreciation for the wild lands that are fast disappearing. Those untouched landscapes and everything in them are a valuable resource, even the insects. Honeybees are responsible for the pollination of around a third of our country’s crop varieties, such as fruits and nuts. But for much of the last decade, beekeepers have been losing 30 to 50 percent of their hives to colony collapse disorder. This alarming decline threatens agriculture not only in the United States, but across the world. Governments and other entities encourage all of us to take practical steps to slow this trend, such as avoiding the use of pesticides and protecting or starting beehives. Diana Skinner and Susan Lechtenberg, charter members of the newly formed Back Country Horsemen of Kansas, discovered a honeybee hive near the Spirit Trail, one of the South Shore horse trails at Clinton Lake, just west of Lawrence. This colony of bees had built their hive in an old 30 gallon metal drum that was mostly buried in the ground. Because the bees were beginning to swarm, Diana and Susan decided to enlist the help of an expert in removing the hive to prevent horses and humans from suffering stings in the future. Richard Bean from Blossom Trail Bee Ranch in Baldwin City came to in­vestigate. They hiked about a mile up the trail with Richard’s bee gear, including a sting-resistant suit, hat with veil, shovel, burlap sack, twine, and hive smoker. He used an interesting combination of hand packed dryer lint, dried pine needles, pecan shells, and a couple of sticks as kindling for the smoker. They cut a few small pine trees to give Richard room to observe the bees. Although honeybees do not usually nest in the ground, he confirmed that they were indeed honeybees. Wearing his protective clothing, Richard shoveled gently around the barrel to pull it out while Susan watched from a safe distance. They waited about a half hour for the bees to return to the hive. After finding the barrel too heavy to carry out by hand, they transported it to the trailhead in a wheelbarrow. Thanks to Back Country Horsemen of Kansas, the Spirit Trail honeybees are enjoying their new home at Blossom Trail Bee Ranch. Richard tried to transfer them to a traditional beehive, but most of them continue to use the old barrel. Although honeybees generally aren’t aggressive, some folks can have a life-threatening allergic reaction to a single sting. Relocating the hive to a place where they aren’t a danger to people and domestic animals preserves the safety of the trail and protects the bees we depend on to pollinate our crops. Osteoarthritis (OA) is a progressive degradation of articular cartilage that is a common cause of lameness for athletic horses. Oral supplementation of compounds that prevent cartilage degradation or joint injury is an attractive solution for lameness. In many parts of the country, winter means increased stable time, decreased riding time and significantly different nutrient requirements for horses, said Louisiana State University AgCenter equine specialist Neely Walker, MS, PhD. And despite mild winters in other parts of the country, decreased temperatures and wet conditions will affect the demands on the horse’s body for heat production. A horse’s energy requirements start to increase once the temperature drops below the animal’s critical temperature or the horse’s natural comfort zone. “Your horse’s critical temperature will depend on his current nutritional status, environmental temperatures, wind, and wet hair coats,” Walker said. For example, she said, a 1,000-pound horse should receive an additional two pounds of hay when the temperature drops 10 degrees (for example, from 40 degrees to 30 degrees). It is less effective to feed concentrates, such as grain, to maintain a critical temperature, Walker said. Hay is a more effective way to maintain critical temperature. “Forages contain higher fiber content than concentrates,” she said. The digestion of fiber results in a greater amount of heat being produced than the digestion of grain. Therefore, feeding hay will keep the horse’s critical temperature stable despite the environmental conditions. During cold weather, horse owners might also notice a greater frequency of impaction colic. One of the main causes of impaction colic is dehydration. Reduced water intake, combined with increased hay consumption, can lead to more incidence of colic, Walker said. Maintaining the temperature of water sources at 50 degrees to 65 degrees will encourage adequate drinking, which should be about 12 gallons a day. He might seem perfect—but before you call him yours, determine if a horse is sound and serviceable for the job at hand and if you can live with his inevitable flaws. After months of meticulous horse-shopping, you’ve finally found the perfect fit. You’re so excited you could hook up the trailer and load the horse before the ink on the check dries. However, there is one step in the buying process that you cannot skip if you’re wanting to make an informed decision: the prepurchase exam. California racing officials have identified a connection in the sudden death of six horses with trace amounts of anticoagulant rodenticide in their systems, the state horse racing board was told Dec. 18. Dr. Rick Arthur, California Horse Racing Board equine medical director, said the horses, who died between Dec. 21, 2012, and Sept. 18 of this year, all expired due to internal bleeding following exercise. Necropsy exams found each had only trace amounts of a strongly toxic anticoagulant used in the extermination of rodents at racetracks in their systems. Arthur said the level of toxicity found in these cases was so low it would not have been enough to kill the horses, but in combination with exercise he believes the poison proved fatal. Question: I really enjoy your monthly Conformation Clinic column. The information is very useful when I work with and care for sporthorses, but I'd also like to know what endurance horse conformation and qualities I should look for when selecting a mount. Can you offer any suggestions? Winter doesn't have to be—and shouldn't be—a time of hibernation for your horse. Come May, Trisha Dowling, DVM, Dipl. ACVIM, ACVCP, of Saskatchewan, Canada, is ready to take on the challenges of competitive endurance—and, equally important, so are her horses. The same can be said of Carey Williams, PhD, of New Jersey. Her sport is eventing, in which she competes spring through fall. Andy Kaneps of Massachusetts used to raise and compete hunters and jumpers; today he prefers riding noncompetitive dressage year-round. All three riders and horse experts have a few things in common: they recognize the importance of working their horses throughout the winter. Winter workouts are valuable for maintaining fitness, preserving training, and promoting mental well-being. Winter exercise also provides an opportunity to fix problems in a horse's training and prepare both horse and rider for the upcoming competition or riding season. In addition to their exceptional credentials as experienced riders and trainers, all three have equine scientific backgrounds, lending their knowledge of the horse's physiology to their fitness plans. Genes related to strength, speed, and agreeableness differentiate ancient wild horses from contemporary domesticated ones, new research reveals. New York — Speed, smarts, and the heart of a champion: using genomic analysis, scientists have identified DNA changes that helped turn ancient horses such as those in prehistoric cave art into today's Secretariats and Black Beautys, researchers reported Monday. Understanding the genetic changes involved in equine domestication, which earlier research traced to the wind-swept steppes of Eurasia 5,500 years ago, has long been high on the wish list of evolutionary geneticists because of the important role that taming wild horses played in the development of civilization. Once merchants, soldiers and explorers could gallop rather than just walk, it revolutionized trade, warfare, the movement of people and the transmission of ideas. It also enabled the development of continent-sized empires such as the Scythians 2,500 years ago in what is now Iran. It was all made possible by 125 genes, concluded the study in Proceedings of the National Academy of Sciences. According to the latest study1 published on the topic, the answer is no, but other experts suggest there is far more to the story and that we shouldn’t jump to conclusions. “There are several other studies both in live animals and in a laboratory setting that support the use of various joint supplements, leaving some of us optimistic that joint supplements are important,” says Kathleen Crandell, PhD, equine nutritionist at Kentucky Equine Research (KER). Strangles. Even the common name for this bacterial disease—caused by the sinister Streptococcus equi—sounds like something of legend, a cautionary tale inscribed by medieval monks. Mugsy Dehere is a 6 year old OTTB and a SURE FOOT junkie. As a racehorse Mugsy was very, very girthy and had to be tacked up while walking. He reared whenever someone attempted to saddle him while he was tied or standing still. When Cathy Gulick started using Mugsy as a horse for her husband she had to figure out someway he could be safely tacked up on crossties. Cathy knew about the SURE FOOT Equine Stability Program because she was my demo rider for the (soon to be released) DVD. She decided to give it a try with Mugsy. Cathy did a few SURE FOOT sessions with Mugsy to introduce him to standing on the stability pads. Then she tried standing him on the pads while being tacked up. He stood very still and actually relaxed even more as she saddled him. Since then Cathy has been using the pads every time she tacks Mugsy. He has not even come close to having any issues since she started using SURE FOOT. In addition, he is moving more freely in the shoulder and going better under saddle. Quite simply it is an opportunity for your horse to become aware of his habits and change his own behavior and movement. This may seem quite astonishing at first when you consider that your horse can reprogram his own brain. But that is exactly what happens. You offer your horse an opportunity to experience the way he stands habitually by placing an unstable surface under his hooves. Beginning with one foot at a time the horse chooses whether or not to remain on the pads. The experience is an offer not a requirement. It is imperative that the horse can choose to stand on the pads or not and for how long (although I will at times ask the horse to walk off). This is quite different from training, which is when we impose our ideas on the horse. Even if the training is “good for him” it is still something we decide we want the horse to do rather than something the horse wants to do. 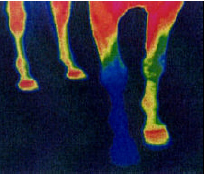 What are a Horse's Comfortable Temperature Ranges? Every year as the days get shorter and temperatures drop horse owners wonder if they should blanket their horses. If they do blanket them, what weight of blanket? Do they need to go out and change the blankets several times a day as the temperature changes? Do these decisions change if the horse is clipped? Should the horse be clipped? Should arenas and barns be heated? Most horse owners are quite aware that horses seem to prefer much cooler temperatures than they themselves do. Therefore deciding to blanket a horse just because people feel the need to wear sweaters and coats is obviously not the correct approach to deciding upon horse apparel. Horse owners are also frequently dog owners, so it should come as no surprise that dogs often accompany their owners to competitions, clinics, and other equine events. But dogs can pose horse health risks in some cases. Consider these tips before bringing your pup along to your next event. The old adage "mother knows best" doesn't just apply to humans--it appears to apply to horses as well: Danish researchers recently observed that foals that watched their mothers calmly handle scary objects ended up being less fearful themselves. “It does appear possible to reduce foal fearfulness through the mare,” said Janne Winther Christensen, PhD. She presented her study results at the 2014 International Society for Equitation Science conference, held Aug. 6-9 in Bredsten, Denmark. A question that often comes up when riders are thinking about moving up to a longer competition distance is, "How do I know my horse can go that far?" It is a legitimate concern whether you are moving your horse from the LD distance to the endurance distance or from 50-mile rides to 100-mile rides. Most endurance riders do not take their horses on 100-mile training rides before attempting their first 100-mile competition. But there are several things you can do to maximize your success both in training and conditioning before the competition and during the ride itself. This article will focus on moving up to the 100-mile distance but the suggestions given will work when moving up to any distance. -- What strengths does a good 100-mile horse need? -- How does my horse rate in those areas? -- A 100-mile horse needs to be free of any metabolic or mechanical abnormalities. -- The 100-mile horse should be able to maintain a steady and efficient pace that does not waste energy. -- A 100-mile horse needs to be able to take care of himself on the trail. He should be comfortable eating and drinking on the trail and in vet checks. An early blast of arctic cold has landed in the Bluegrass, putting pressure on farmers to make sure their animals are ready for the assault.